Organizers of the Easter egg hunt in the Bancroft Park area of Colorado Springs decided to cancel the event after parents at last year’s hunt became “too aggressive.” Hundreds of parents reportedly jumped the rope and entered the kids-only area to ensure their kids got the most free eggs. The hunt was over in a matter of moments, and many kids were left with nothing. Talk about missing the point. 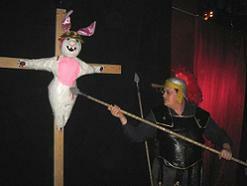 Hunting Easter eggs is a violent tradition, born over a thousand years ago in medieval Europe. The first Easter eggs weren’t eggs at all, but were rounded stones that were thrown at local Jews during Easter celebrations. The horrible head wounds they inflicted left many of the stones covered in blood, and that is how the custom of coloring eggs was born. You shouldn’t cancel an event because of aggressive parents; you should embrace the violence. Make it a parents-only contest, and make it clear that the adults who gather the most candy for their kids clearly love them the most. Give everyone two minutes to take all the candy they can, and when the whistle blows they can keep whatever they’re clutching in their battered, bloody fists. On a related note, please join me for the first annual Fredericksburg, VA Easter Candy Battle Royale on April 8th at Winsome Park. All participants will be frisked, and no weapons are allowed. As always, liquor is welcome.